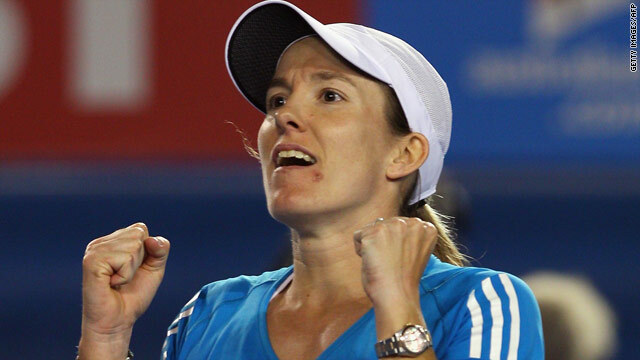 Justine Henin celebrates her 7-5 7-6 (8-6) victory over fifth seed Elena Dementieva at the Australian Open in Melbourne. Justine Henin booked her place in the third round of the Australian Open after she claimed a 7-5 7-6 (8-6) victory over fifth seed Elena Dementieva. Fellow Belgian Kim Clijsters came through in straight sets - 6-3, 6-3 - in her clash with Thai veteran Tamarine Tanasugarn. Third seed Svetlana Kuznetsova recorded a 6-2 6-2 victory over fellow Russian Anastasia Pavlyuchenkova. (CNN) -- Justine Henin booked her place in the third round of the Australian Open after she claimed a 7-5 7-6 (8-6) victory over fifth seed Elena Dementieva in Melbourne on Wednesday. The Belgian, who won the tournament in 2004, came through an enthralling clash which lasted two hours 50 minutes at the Rod Laver Arena. Henin, who is playing in her first Grand Slam event since she ended her 20-month retirement from tennis, took the first set but Russian Dementieva hit back in an enthralling second set to take a 4-2 advantage. Wildcard Henin then broke back to take the next three games and the match went to tie-break but Dementieva was unable to take the match into a third set as Henin clinched victory with a fierce volley. After the match Henin admitted it was exactly the kind of match which vindicated her decision to return to competitive tennis. "It's great feeling. It's magical to win this kind of match in this kind of atmosphere," Henin told reporters in the post-match press conference. It's magical to win this kind of match in this kind of atmosphere. "The crowd gave me so much. So respectful at the end. It was a special night tonight. That's why I probably came back on the tour, was to live this kind of matches." Henin will now play another Russian in 27th seed Alisa Kleybanova with a potential quarterfinal on the horizon against compatriot Kim Clijsters who came through in straight sets - 6-3, 6-3 - against Thai veteran Tamarine Tanasugarn. Fellow Belgian Wickmayer continued her recent good form by knocking out Italian 12th seed Flavia Pennetta 7-6 (7-2) 6-1. Elsewhere, third seed Svetlana Kuznetsova recorded a 6-2 6-2 victory over fellow Russian Anastasia Pavlyuchenkova while Denmark's Caroline Wozniacki overcome a nervy first set against Canadian Aleksandra Wozniak to win 6-4 6-2. Seventh seed Victoria Azarenka of Belarus cruised to a routine 6-2 6-0 victory over France's Stephanie Cohen-Aloro while Russian Vera Zvonareva eased past Slovakian Kristina Kucova by the same margin.